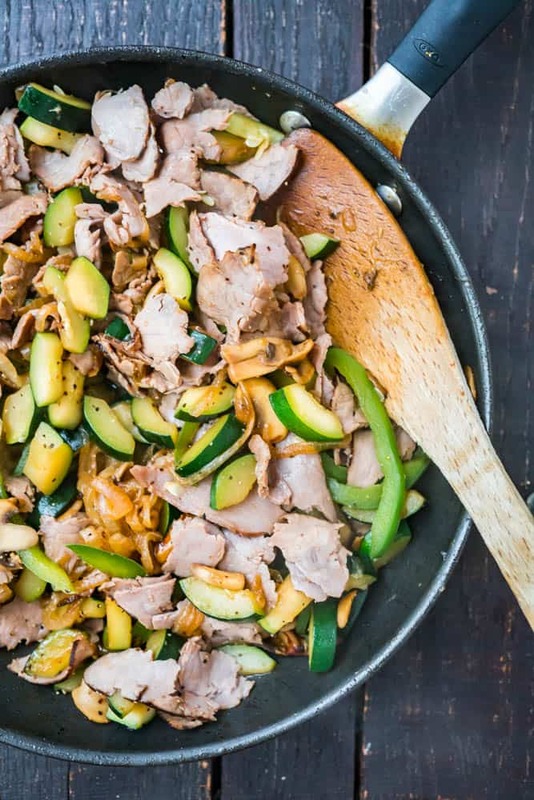 We’re always on the hunt for quick and healthy things to throw together when we don’t have time to cook, or on those days when we’re just plain lazy. 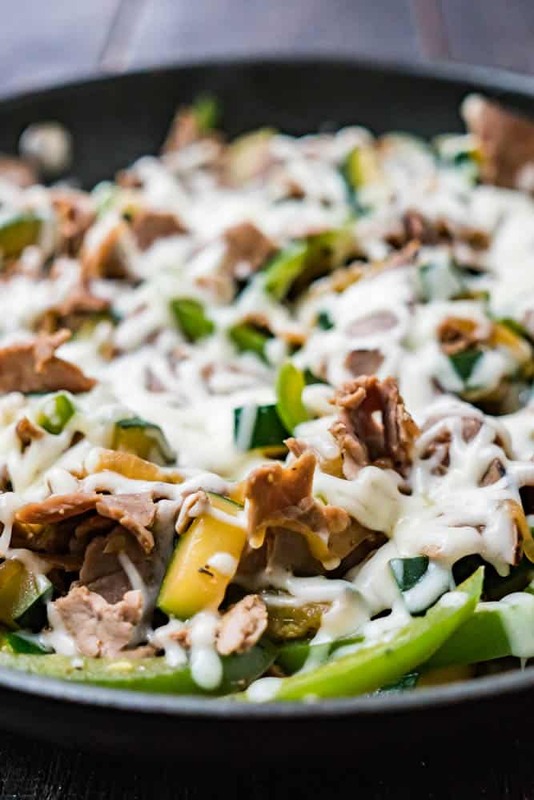 This recipe is a result of one of those days (the lazy kind) – 20 Minute Cheesesteak Skillet. Hell yeah! So, about two months ago, Cody and I made a pact that we would eat out less. It was mainly for the sake of being healthier, but also to save a bunch of money since, you know, our baby is due in December and we’re also halfway through building a Tiny House On Wheels. Those things cost money, and they tend to cost more than you had originally anticipated. So, as part of the eating-out-less rule we made another rule that we won’t buy groceries until we’ve used everything in the fridge – that’s been the best one, because it really prevents us from allowing stuff to go bad (we used to have a bit of a problem with that), AND it makes you think creatively about ways to throw those random bits into a pan and make it a meal. 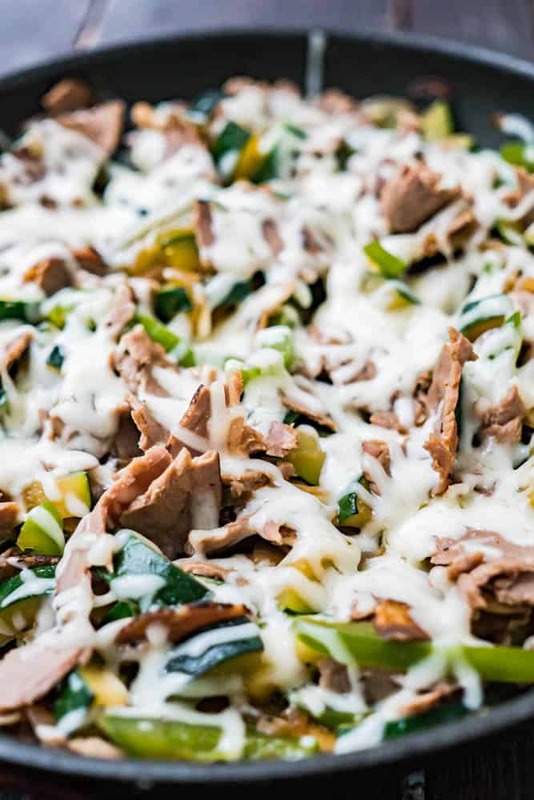 A lot of the time we end up making scrambled eggs with a weird collection of veggies in it, but occasionally something special happens – like a Cheesesteak Skillet. We had a pack of fresh, thinly sliced roast beef from the Deli section of our grocery store and were not sure what we were going to do with it. We found a large zucchini, an onion, half a pack of mushrooms, and half a green pepper in the fresh drawer of our fridge. Didn’t take long for us to have a lightbulb moment with this one. Tossed it into a pan and finally topped it off with the last bit of provolone/mozarella blend in the fridge and voilà! Best part about it? One pan! 20 Minutes! Yassss! Hardly any cooking time and hardly any clean-up time. This is a win-win recipe if there ever was one. Melt a little bit of lard in a pan over a medium heat and sauté the onion for a minute or two until it start to become translucent. Add the mushrooms and turn up the heat. Sauté until the onions and mushrooms are nicely caramelized. Approximately 5 minutes. 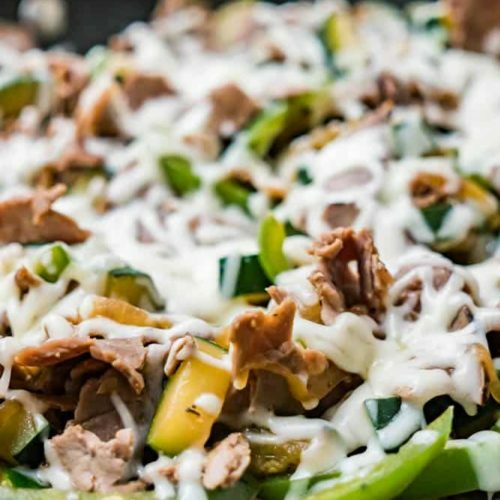 Add the green pepper and zucchini and sauté for a couple of minutes until it reaches your desired level of tenderness. Season with salt and pepper. Finally, tear the sliced of roast beef into smaller bit and add to it, stirring until everything is nicely hot throughout. Sprinkle the cheese on top and serve with a little squirt of mayo or ketchup.